This week, we finally saw a break in the summer heat. I have been through enough 100+ degree days to last me a lifetime. It was 106 at the beginning of the week, but Wednesday brought rain, and with that, thankfully, some cooler temperatures. I always seem to struggle a bit with meal plans in the warmer months. I can always come up with tasty warm and hearty meals, but light and cool fare is a bit more elusive to me. My hubby is not a fan of cold soups, and while summer seems to be a season to get some use out of the grill, I just can’t hang out outdoors in this crazy heat we’ve been having, cooking over an open flame. So, one of our favorite summer stand-by suppers is the Fruit, Nut and Cheese Plate. Every time I go to a reception of some sort, I’m always hovering over the fruit tray and the cheese cube tray, and that’s what gave me the idea for this dinner. It is so easy, and everyone can pick out the parts they like the best! “Plate” is a term I used loosely, since we just pick out of the bowls. Believe it or not, this is just for the two of us, though we did end up with a little bit of leftovers. 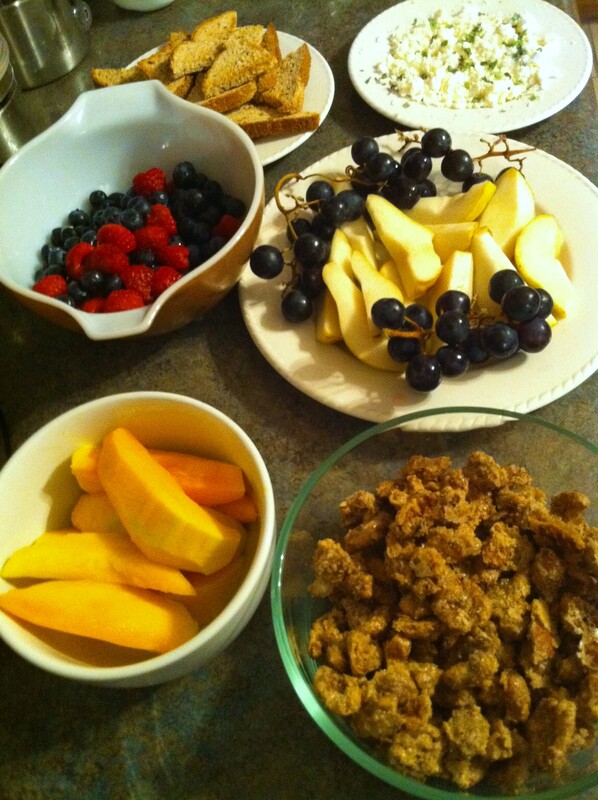 In the front, we have mango and spiced nuts, followed by a plate of pears and black grapes, and a bowl of raspberries and blueberries, and finished up on top with cheese and toast points. We don’t usually do the toast, but this time I tried out making homemade cheese, and it was the consistency of feta, so we spooned it onto the toast. YUM! What is so great about this is that you can customize it to your taste preferences, use your favorite fruits (I definitely prefer pears to apples) and cheeses, or score what’s on special at the grocery store (black seedless grapes, 99 cents/lb!). And, if you choose to purchase your spiced nuts instead of making them yourself, you don’t have even have to turn on the oven. So, what are your favorite cool summertime suppers? One Response to "Cool Summer Supper"
I rea?ly love ?o?r blog.. Ver? nice colors & theme. w?at th? theme is c?lled. Thanks!